Scott Free is the world’s greatest escape artist. He is also an extraterrestrial god, the prodigal son of the leader of the good deities in an unceasing war in the heavens. He is also happily married. He also just tried to kill himself. Jack Kirby’s ‘Fourth World’ is a brilliant, insane and eclectic invention. The veteran comic creator wrote and illustrated several series for DC in the 1970s that established a cosmic war between two planets of immortals, the zany inhabitants of which spilled into the Earth of Superman, Batman et al. DC has revisited this subsection of its canon many times over the years. The reality-shattering scale of the Fourth World has been pivotal to several of DC’s major and recurrent reinventions. The overarching villain of the series – Darkseid – regularly features as one of the greatest enemies of the Justice League, and is the set to be central antagonist of the DC cinematic universe. Bur for all this, a lot of the original and strangest characters of the Fourth World are neglected in modern adaptations. One in particular is Mister Miracle, aka. Scott Free, often overlooked for not fitting the mold of a standard superhero. In the Vietnam-tinged analogy of the original comics, he was the conscientious objector and all his abilities related to fleeing conflict, rather than resolving this. 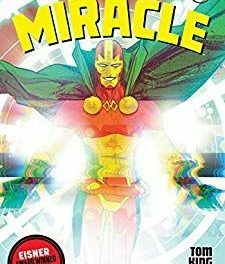 The too-often neglected character and his warrior-goddess wife Big Barda are the protagonists of Tom King and Mitch Gerad’s acclaimed run of Mister Miracle, now collected in a single edition. The comic takes a drastically different, yet totally faithful and appropriate approach to the subject matter. Scott is indeed an escape artist but this series is not concerned with his flight from physical peril. Rather he must escape existential quandaries. Can he escape into suburban life in LA with his wife? Can he escape the web of prophecy that his supernatural origins are intimately tied to? Can he escape the depression arising from his traumatic childhood? Can he escape anxieties about his marriage? Can he escape a war in heaven so he can finish renovating his condo with Barda? Can he escape the feeling that maybe he did manage to kill himself in the first issue and is now in the afterlife? Can he escape the suspicion that this comic is being written by his adversary? Compare this against King’s other award-winning series of recent years, The Vision. King’s run on Vision with Gabriel Hernandez Walta took a similar approach in that it reworked a superhero story into a domestic drama. The problem with that laudable but, frankly, somewhat overrated run was that the moral and familial narrative was at odds with the superhero story. The most interesting and complex aspects of its plot had to give way to a simplified conflict about punching capes. Here, the nature of being a cosmic superhero is fundamental to the premise and empowers it: this is one more obligation for Scott to escape. Further than this, a fundamental part of the story is Scott extricating himself from the form and clichés of the superhero genre itself: why would he want to be part of the inane and nonsensical continuity snafus of a published reality that is forever in flux? The comic is bold, well thought-through and refreshingly experimental. It isn’t afraid to deviate from and be critical of the conventions of its genre. The high concept design of the panelling shows a intentional and directed style to the formal storytelling. Like a lot of my favourite comics, it is on some level about comics. That said, I do have a few reservations recommending this to everyone. 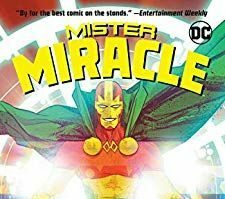 Idiosyncratic elements from Mister Miracle’s publication history – such as his promoter and transparent Stan Lee-pastiche Fuzzy Flashman, and allusions to the cheesy caption narration of the 1970s comics – might confuse some. I am not against a work appealing to a smaller informed readership. But there is an assumption of prior exposure to Kirby’s 1970s comics which, whilst not insurmountable, will alienate some. But Mister Miracle is not concerned with offering the same experience as normal superhero fare. It’s wacky and dark and inspiring and designed to escape expectations. Paradoxically, it will ensnare you if you let it.